The ultimate purpose of Greater Grace Temple is to lift up the name of the Lord and to give all glory unto God, who has given us the highest revelation of Himself in the person of our Lord and Savior Jesus Christ. We will strive to fulfill our purpose by helping spread the Gospel in the Miami Valley and throughout the world. For Matthew 28:19-20 says "Go ye therefore, and teach all nations baptizing them in the name of the Father, and of the Son, and of the Holy Ghost: Teaching them to observe all things whatsoever I have commanded you; and, lo, I am with you always, even unto the end of the world. Amen"
Our mission is to reach the "un-churched" and the "under-churched" segment of society by helping those who do not fit into normal church settings and those who feel overlooked, forgotten, and those who are "crippled at the gate". This is in accordance to Acts 3: 2, 6-8 "And a certain man lame from his mother's womb was carried, whom they laid daily at the gate of the temple which is called Beautiful, to ask alms of them that entered into the temple;' Then Peter said, Silver and gold have I none; but such as I have give I thee: In the name of Jesus Christ of Nazareth rise up and walk. And he took him by the right hand and lifted him up: and immediately his feet and ankle bones received strength. And he leaping up stood, and walked, and entered with them into the temple, walking and praising God." In our worship we want to encourage Christian growth and development. In order to fulfill our purpose, we must help build up the body of Christ for this is plan set in God's word in Ephesians 4:11-15 "And He gave some apostles; and some prophets; and some evangelists; and some pastors and teachers; For the perfecting of the saints, for the work of the ministry, for the edifying of the body of Christ: Till we all come in the unity of the faith, and of the knowledge of the Son of God, unto a perfect man, unto the measure of the stature of the fullness of Christ: That we henceforth be no more children, tossed to and fro, and carried about with every wind of doctrine' But speaking the truth in love, may grow up into him in all things, which is the head even Christ:"
Finally, as we lift up the only wise God, our Lord and Savior Jesus Christ; we strive to promote cultural unity in ministry and worship. For in Revelation 14:6-7 it says "And I saw another angel fly in the midst of heaven, having the everlasting gospel to preach unto them that dwell on the earth, and to every nation, and kindred, and tongue, and people, Saying with a loud voice, Fear God, and give glory to him; for the hour of his judgment is come: and worship him that made heaven, and earth, and the sea, and the fountains of waters." Our church family will continue to carryout our mission with the love and power of God... "Preparing lives for eternity"
In January 1991, Elder Ronald M. Logan began a Bible study at the home of Dr. Darryl and Mrs. Debra Mabra with four people present. Four months later, the Bible class was moved to the Senior Citizens Building on Chestnut Avenue to a room seating twenty-five to thirty people. At this time, Elder Logan appointed a treasurer, Dr. Wanda Stewart, and three advisors, Jim Hardin, Dr. Darryl, and Mrs. Debra Mabra. Convening every Tuesday evening, the class grew steadily and Elder and the advisory board began to look for larger accommodations. The summer of 1991, certain members of the Bible study approached Elder Logan with the desire to convene on Sundays; Elder Logan began to seek God for direction. With prayer answered, he sought the blessings of his pastor, District Elder Cecil A. Pratt to start a church. In September of 1991, the 402 Union Hall of Navistar was contracted for available Sundays and Tuesdays. At this time, the church became incorporated and was named "Greater Grace Temple." As membership, increased, Greater Grace Temple rented Roosevelt Middle School and Hope Lutheran Church for Sunday and weekday services. In October 1996, Greater Grace made the first installment on twenty-one acres of land in Springfield, Ohio. This land is adjacent to interstate 70 on Leffel Lane and is in the midst of a rapidly growing section of town. On June 21, 1998, Greater Grace Temple held a deed burning service celebrating the full payment of the land. 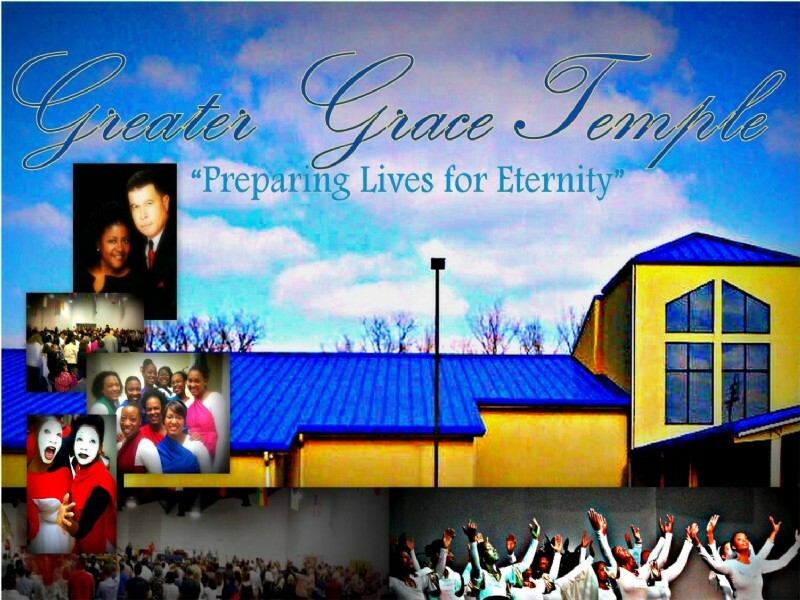 Eleven years from the day Greater Grace Temple was founded, in July of 2002, a multipurpose facility that had a seating capacity of 900 was completed. With compassion for Christ and His people, the ministry has strived to be a lighthouse for people of all ages. Our future goals are to complete a full gymnasium, and sanctuary along with a senior citizens home on the backside of our property. These past years have been fruitful and exciting and we are looking for God to fulfill the vision, as His coming grows imminent.